Wolf Peach – May 9th, 2015 | Feed Me, Milwaukee! As I wrote in my first post, on Saturday, May 9th, my girlfriend and I visited Wolf Peach, in Brewer’s Hill. Unlike I wrote in my first post, however, my mother was unable to attend, due to unexpected circumstances. Oh well. What started as a Mother’s Day reservation turned into a lovely date, and it gives me an excuse to take her somewhere else in the city as a rain check. We arrived just after 7:00pm, for our reservation. The restaurant was very busy, but our table was ready and waiting for us. While we didn’t get the best seat in the house, we still had a corner view of the city. 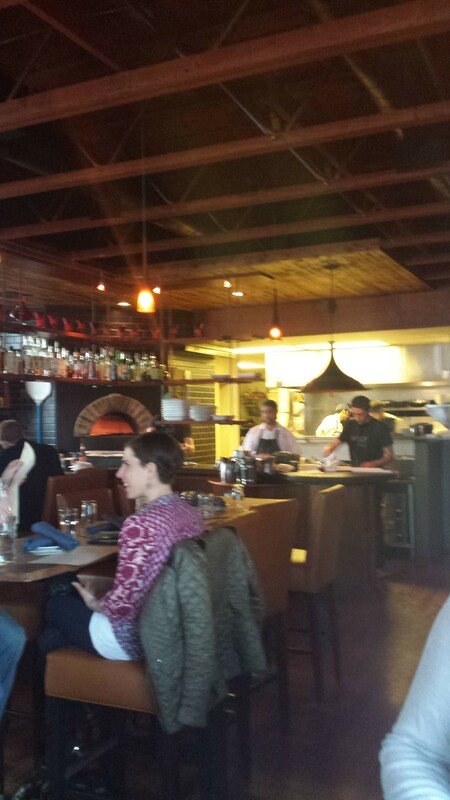 Not that it matters much to us; the view of the open kitchen from our table was splendid. 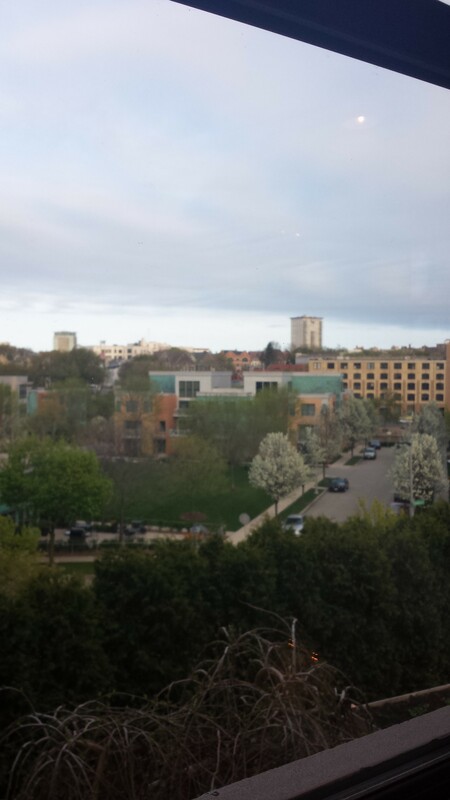 However, for those willing or able to get reservations for the balcony space, the restaurant boasts an amazing view of the Milwaukee city skyline from the top of Brewer’s Hill. The first thing we noticed was the mismatched glasses and silverware. Combined with the simple, rustic decor (which I must admit is a bit of an annoyingly common theme in Milwaukee restaurants), it lent a nice soft glow and home-y attitude to the place. Our waiter was a charming bespectacled gentleman with more than a passing resemblance to Johnny Depp in Ray-Bans, with a friendly, genial attitude and an excellent smile. 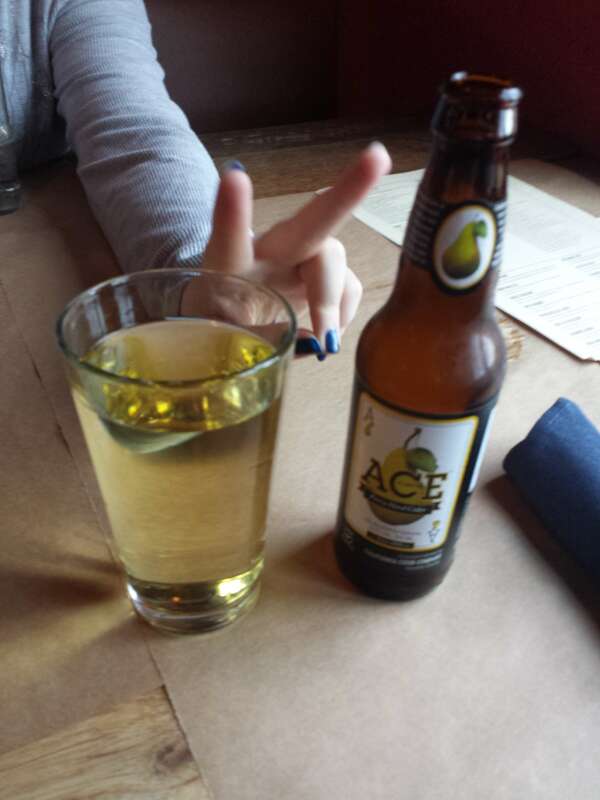 We ordered our drinks and took the time to peruse the menu; Sydney ordered a Sprite (she’s still 20, after all) and I ordered an Ace Perry, a Californian pear cider with a delightful crisp sweetness. Since we had a curtain call at 9:00, I decided not to get any of their handmade cocktails, though at least one was calling my name, a cocktail centered around rhubarb spirits. Since the restaurant ascribes to the “como viene” service style (basically, restaurant speak for “as soon as it’s done”), the waiter informed us that the dishes would be sent out to us as they are done, and paced appropriately. Prepared, I had him enter the bone marrow, duck eggs, and pizza first, and hold off on the pork belly for later. The table service was friendly and professional. 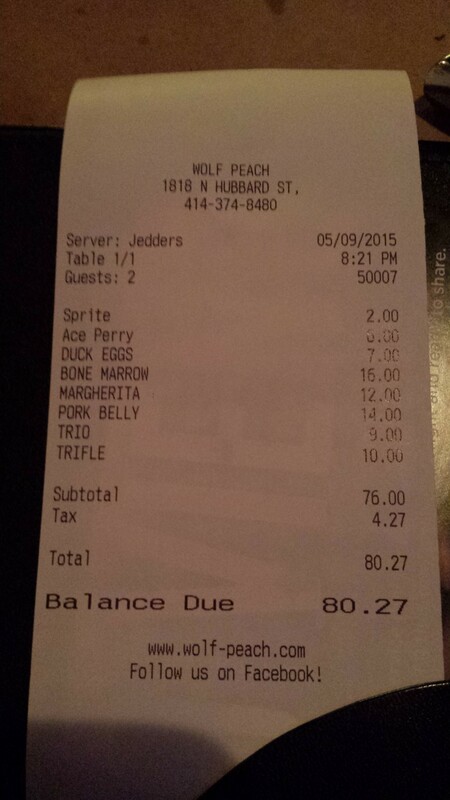 We held onto one menu and the drink list. 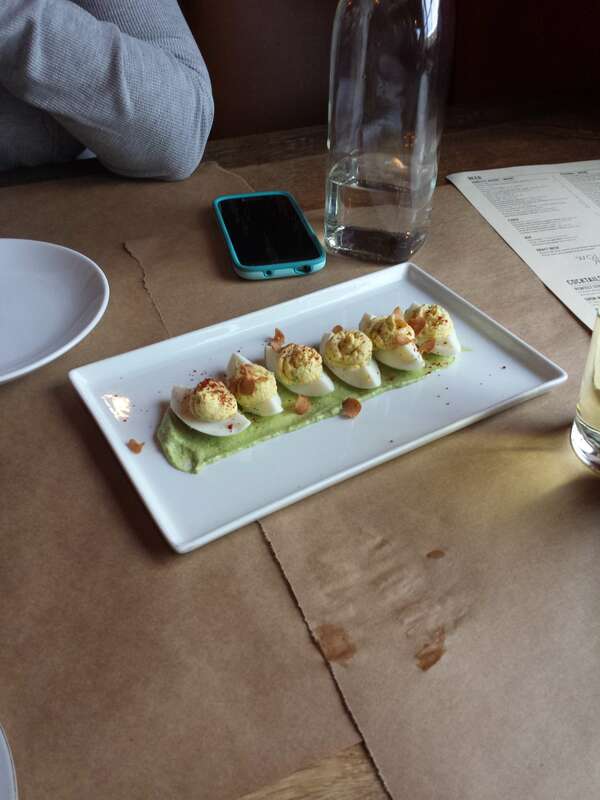 Our first course to arrive was the Deviled Duck Eggs. Served in quarters atop a sauce accurately referred to as “Green Goddess”, and topped with pickled garlic chips, the dish was a sneaky way to get around Sydney’s dislike of everything egg-related other than hard-boiled and deviled eggs. Neither of us had ever had duck egg before, and it was delightful. While the duck egg and the deviled yolk blend was fresh and well-composed, the sauce and garlic chips gave it the perfect amount of smoke, spice, and herby, lemony tartness. For a “vegetarian” dish, it had just the right amount of waterfowl flavor hidden inside to hold it up. 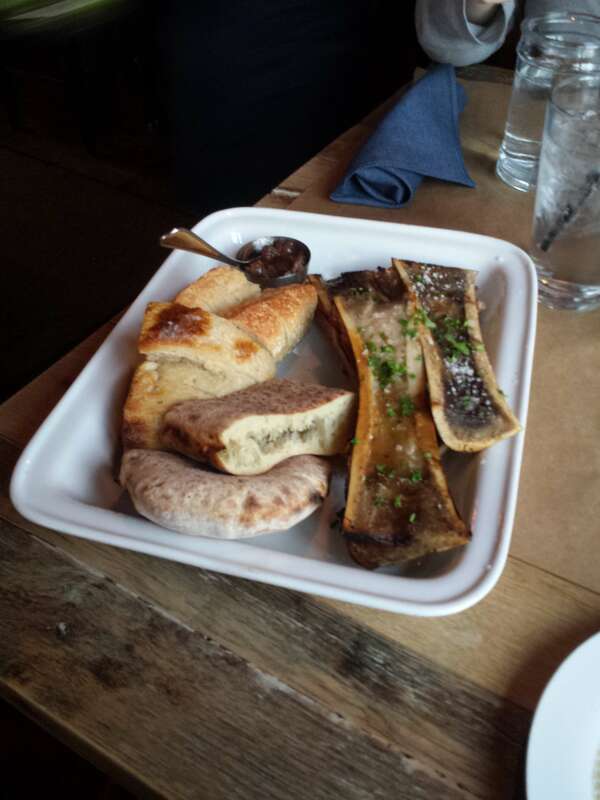 Hot on the heels of the duck eggs came the miraculous sizzle of the smoked bone marrow. Smoked and baked, and covered in a light coating of sea salt and parsley, it was by far my favorite course of the entire evening, and it came highly recommended by the waiter. 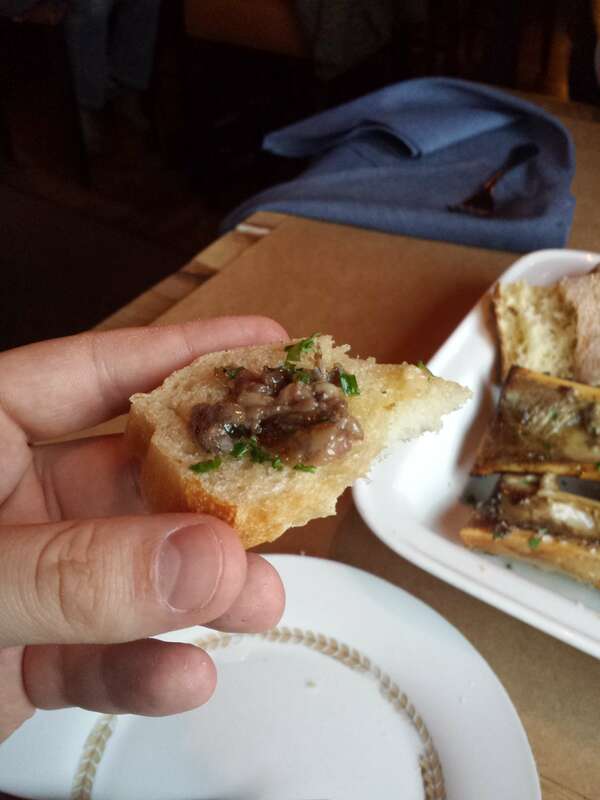 Scooping the slippery, soupy, jellylike marrow out of the bone cavity and onto a piece of toasted French bread or ciabatta was a fabulously visceral experience, a delicious foreplay preceding the orgasmic taste of the smoky, fatty, savory marrow and the crispy fresh bread. Sydney and I couldn’t stop scooping and shoveling until well after the bones were drawn clean and all of the juices were mopped up by the remaining bread. As soon as we took the last two slices of pizza off the tray, Sydney ventured the question of dessert; as if on cue, the waiter slid a couple of dessert menus slyly across the table and gestured downwards, while turning to me and asking about getting the pork belly started (which we had asked to delay a bit). It took a second for Sydney to realize he had placed the menu in front of her; we all got a good laugh out of it. It had been an hour, and the restaurant had cleared out to about half capacity, from being nearly full when we walked in. The sun was down, and the hanging lights cast a nice gentle glow around the room, cut slightly annoyingly by the kitchen lights visible above the kitchen staff’s heads. The music was cool and just audible above the dull buzz of conversation, without making it hard to hear. 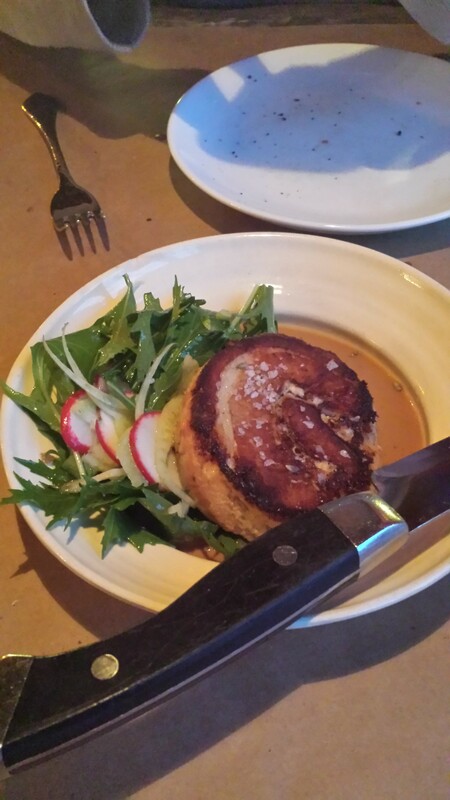 Our braised pork belly arrived minutes later; a roughly hockey-puck-sized round of pork encircled with crispy belly fat and cooked to a crunchy edge. Along the side was an accompaniment of sliced fennel, mizuna, and red radish sliced thin, coated in a light tossing of some sort of oil or subtle vinaigrette. The bottom of the bowl contained a thin layer of the milk braise and pork juices, which served as a dunking sauce for the crispy, flaky pork belly. Sydney and I ended up feeding each other bite-for-bite, which went faster than expected due to the fact we kept trying to rush each other so we could have our turn! The pork was salty and bacon-like, without the excessive greasiness; it had the cleanliness and flavor of fresh, well-fed pig. What I later identified as lavender salt helped trap the juice inside the pork; it ran out in small trickles with every cut into the puck of meat. As we wrapped up the pork belly, the waiter dropped off the check along with our desserts; we had informed him previously that we had a curtain call at 9, and he respectfully upped the pace of the remainder of our meal. 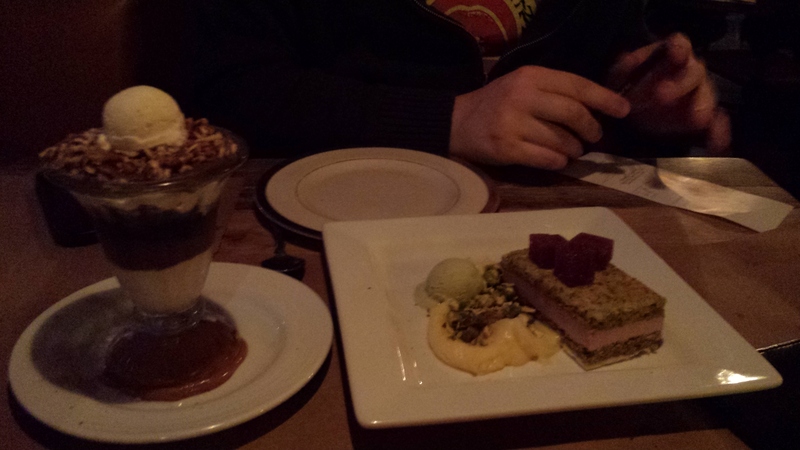 We had ordered the Turtle Trifle for Sydney, and the Strawberry-Basil-Pistachio Trio for me. 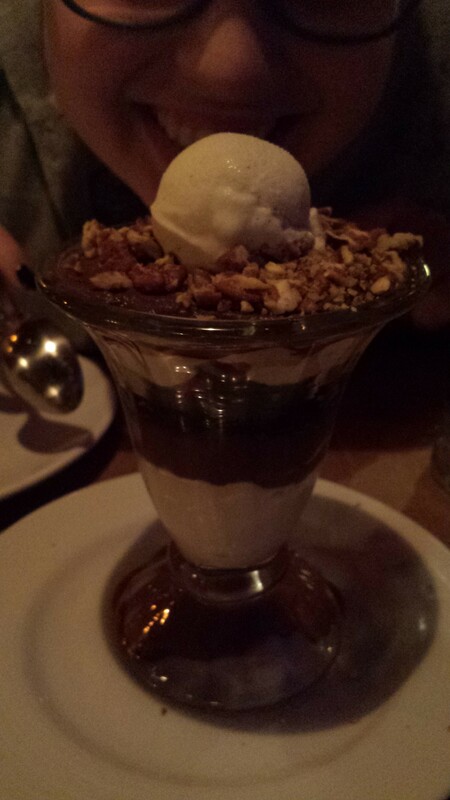 The Turtle Trifle was served in a sundae glass, topped with ice cream, covered in pecans and caramel atop more vanilla ice cream, all over layers of chocolate mousse, chocolate pudding, and what appeared to be vanilla pudding. Underneath the glass was a thick glob of caramel. I believe mascarpone was involved, but I’m no expert at recognizing layered dessert components, and I forgot to grab a picture of their dessert menu… (Note to self: Take pictures of all menus!) Anyway, the dessert tasted like a cold, parfait-like version of a Turtle confection; the nuttiness of the pecans and the salty sweetness of the caramel bounced off the vanilla and chocolate very nicely, and kept demanding we go back for more and more until we were nearly licking the glass. The Trio was a whole different animal. The strawberry square was a soft, spongy layering of softened crushed pistachios and basil in a cakelike blend and a strawberry filling of some sort, topped with three cubes of sugared strawberry jelly, and floored by a thin layer of white chocolate sheeting. Next to that was a spread of lemon pudding coated in dry crushed pistachios, and on the side was a small scoop of pistachio gelato. There was a lot going on in the dish, and as opposed to the smooth blending of the trifle, this one was more of a combination of bright flavors with more muted tones. The lemon pudding was shockingly tart; it looked like vanilla in the dim light, but had an addictive sour clash to it that made cleaning it up a bit of a challenge due to our time obligations for the evening. The jelly cubes were a bit stronger than expected, and notably herby, but were delightful in texture. 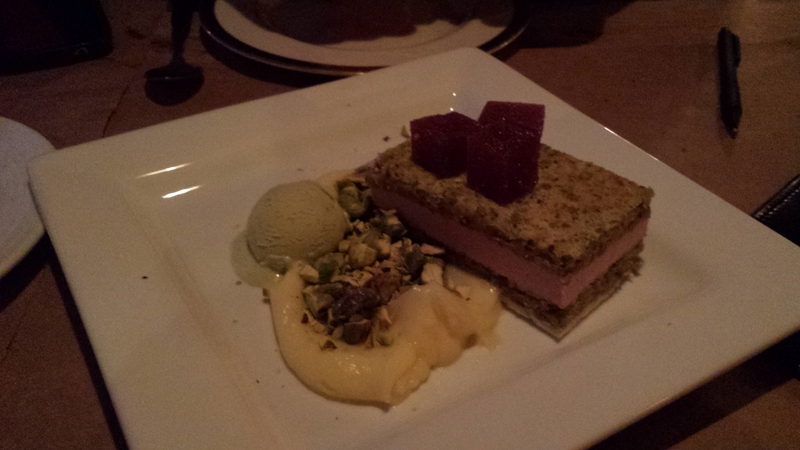 The square was a little muted and soft, but held up nicely with the firmer, stronger white chocolate, and the pistachio gelato, a big personal favorite of mine, tasted better than any I’ve had before. Wolf Peach is a delightful, locally-sourced restaurant with both artfully-rearranged classics and new concoctions that don’t sacrifice flavor and simplicity for the sake of experimentation. The setting is rustic and garden-focused (yes, they have their own functional herb and vegetable garden) in a thoughtful way that takes advantage of the surrounding environment to great effect, using the location on the hillside to set up both dining levels with a stunning view of the city skyline. 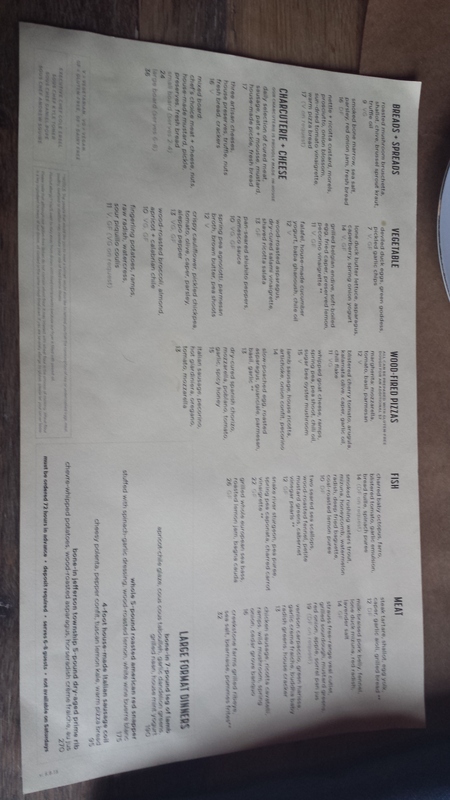 The beer and wine list is bountiful, and the cocktails, while I didn’t get to partake, looked clever and delicious. The service is excellent, with great attention to detail, such as pacing and the needs of the group; it didn’t fold under the pressure of a Saturday dinner rush, either. The music and lighting set just the right mood for a celebratory gathering, a romantic dinner date, or just a finely-crafted cocktail and appetizer at the bar. Even parking is fairly available on the non-metered surrounding streets. 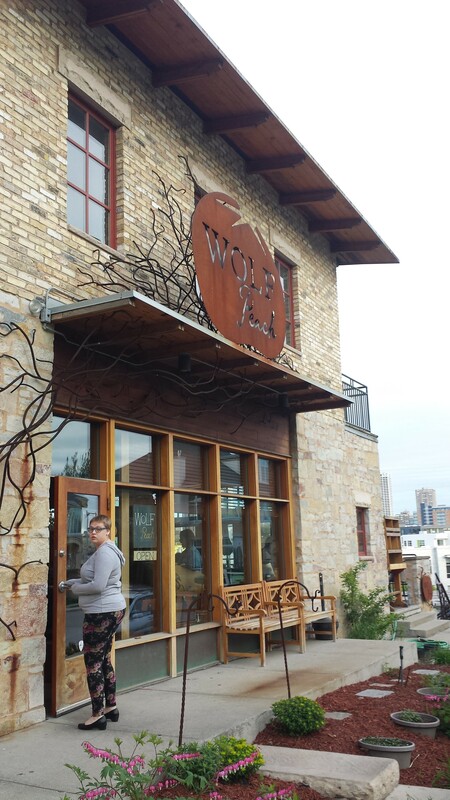 All in all, I’d give Wolf Peach a 9.5 out of 10; it comes highly recommended for a moderately classy date or party tucked into a hidden corner of Milwaukee that few are familiar with, but deserves its own praise. The missing half-point only comes from the prices being just a tiny bit high, preventing me from going there on a regular basis (I’d go back every week if I could afford to), combined with a single misstep in the dessert service being handled by a slightly awkward server. 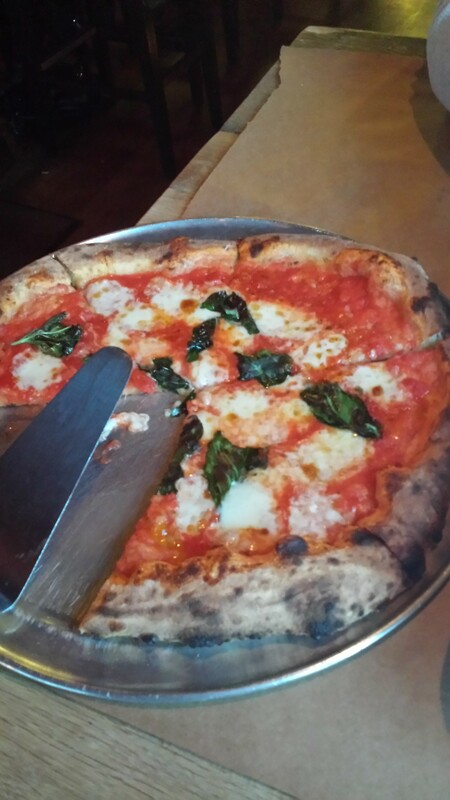 Stay tuned to this blog for announcements on my next restaurant review or dinner engagement. < Previous I am hungry, hear me roar. Next > Meals on wheels? Sounds good to me! Sorry I missed the dinner! 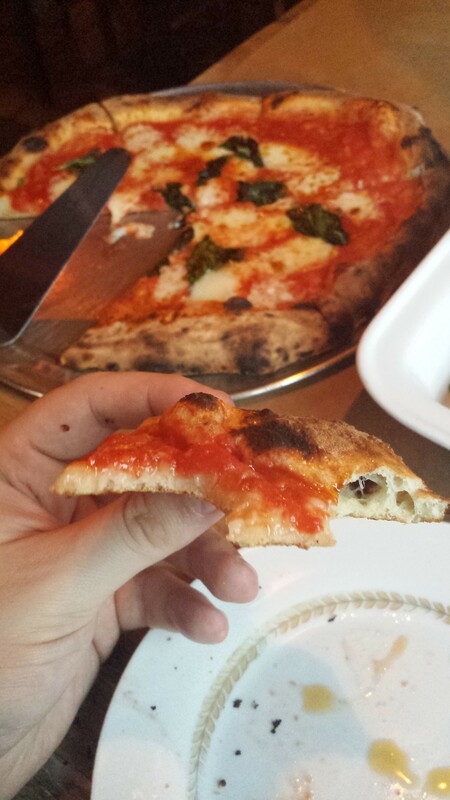 The place sounds terrific and the review superb!